“Never follow me.” With these words, Morrigan vanished into the shadows. Her plans and her whereabouts have remained a mystery… until now. But whether you seek answers, revenge, or reconciliation with your lost love, you may find more than you bargained for. So says the introductory paragraph for BioWare’s Witch Hunt DLC, an add on to their fantasy RPG epic Dragon Age: Origins. But one of the statements in that brief is incorrect, you won’t find more than you bargained for here. In fact, regardless of your own personal objective toward the character Morrigan, each one is catered for and each chosen at the whim of the player. It’s closure. Closure on a grander scale than just simply ending a story. It’s custom designed to tie up tens if not hundreds of hours of emotional investment in character dialogue and relationships formed therein. Contrary to what could be a knee jerk reaction to dismiss the content as pandering and lacking any original story twists, it’s actually an excellent idea. The original, vanilla version if you will, of Dragon Age: Origins was a journey in character interaction. The ways in which you could form relationships and branch the narrative seemed endless, and this aspect hurt the over all experience when it came time to face the last challenge. Having invested tens of hours into these virtual relationships and the players own imagined story growing alongside, at the end of the game a dragon is killed and it’s all over. A few static screens of text later and the credits roll, the player feeling apathetic to saving the world and frustrated over their companions scattered to the winds in a few casual lines of text. Perhaps, like me, you felt unfulfilled by this cavalier approach to your long adventure. Could it be that, apparently, no one in the party particularly cared for each other? Everyone went their separate ways, which seems horribly contrary to the camaraderie and emotional ties the party had built over the many months they were together. No, I don’t believe so. I think it was the easiest and perhaps only way to reach a conclusion and one for which I could lay no blame. To wrap up the many thousands of dialogue forks chosen by players throughout would most likely be impossible in today’s video game medium. The developers at BioWare obviously knew where the real story was in Dragon Age, and it wasn’t in belting the Arch Demon over the head until it fell over. It was in the relationships you forged amongst the main and supporting cast that the real story blossoms, and one which could only be addressed cast member by cast member at a later time. All of the cast? Well, in a world of infinite money and development time, sure. But in reality at least we got off on the right foot; Morrigan was arguably the main character focus in Dragon Age: Origins and her buggering off at the end of the game would have pulled more heart strings for most. So BioWare treats its most love sick customers to final closure in Witch Hunt; the ultimate ‘choose your own ending’ for Morrigan’s story. The playable aspects of Witch Hunt are linear and the encounters mostly throw away, but you haven’t come here to play a game. Instead, you’re here to revel in the fan service that is Morrigan’s closure and it does a perfect job. To my surprise – and I admit, absolute joy – one particular cut scene directly references an item I had saved and kept in my inventory for the duration of the previous game; a ring that Morrigan gifted me at a time when we had become particularly close. This item was of no practical use anymore on the road, yet I could not throw it away, it was as much emotional baggage as physical. It had also been involved in one of the more curious moments in the original game where I had to wonder how the story would have progressed without it. Nevertheless, here it was still playing an important role in driving the story and a most welcome addition too. These moments will come and go, and eventually you will reach the final objective of meeting Morrigan herself once more and the player is given a choice; the final moments can end in conflict or dialogue, a boss battle or a battle of minds. 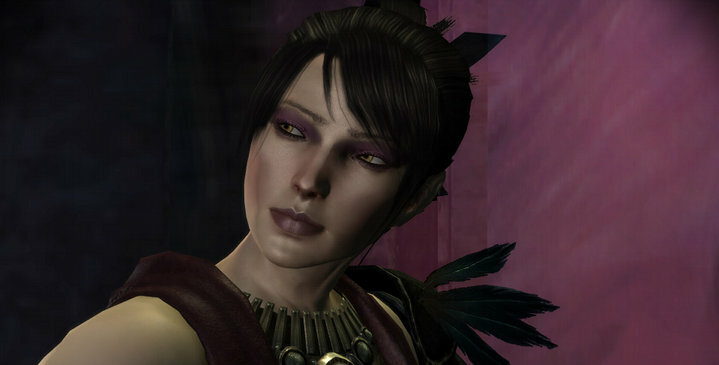 It’s in the latter that the true purpose of Witch Hunt becomes apparent, as each resolution is given equal opportunity and with a little coaxing even the most stubborn of stances can be broken down, even the one spoken of in the opening and of which she was so resolute in the original game: “Never follow me.” Morrigan will break down no matter the choice and your desired ending brought to fruition. Though it is no less effective. In an age where narrative, story, relationships, even romance and erotica are being pushed to the fore by such developers as Lionhead and indeed BioWare, you have to wonder how these dynamic and player driven experiences – often explored in the mind of the player more than the game itself – can hope to be addressed and satisfy. Is the final trick to create a linear experience directly focused on one character alone and allow the player to decide the final moments, regardless of original story intent? Literature and film have the luxury of being a linear experience where each individual story arc can be addressed one by one, the forks decided and closed by the author. But when an interactive medium encourages endless paths and artificial intelligence providing dynamic answers, is it at all possible to have dynamic closure? When you’re no longer invested in an experience only to satisfy reflex and precision, but something much more diverse and chaotic as emotion, will the results always be lacklustre? Witch Hunt has proven that there can indeed be a reasonable compromise and reasonable return on that investment, though perhaps an altogether transparent one. Attempting a Witch Hunt for every character in a video game however – and being on the disc to begin with – would have to be a development and artistic miracle and a project that would boggle the mind. But in order to engage emotion and keep hold for the entirety of the experience, this may be one immediate answer to a very complex problem. >I've been worried about trying the Dragon Age DLC and expansion, simply because my attraction to the world is in the character relationships and branching narrative, while the DLC seemed to only offer questing and combat. Though Witch Hunt promised resolution, I was satisfied with the conclusion to the Morrigan story in Origins and had spent my time romancing Leliana anyway. If the care has been put into the details in Witch Hunt you say, I probably owe it to myself to grab it (and thus the expansion as everyone says WH is to be played last). I'm not sure the same impact is to be found for me as it had for you though. I fear the story tricks and beats it attempts rely on an existing connection towards the Morrigan character that I don't share. >Thanks for your comment Alan.It probably is a rather useless piece of content if you never cared for Morrigan. There is little there in the way of content other than resolution with that character, and the areas quite linear.However, I wouldn't say that you'd have to play Witch Hunt last in the list of DLC. I myself have only played the full original game and this DLC. I have bought Leliana's Song but, sadly, have yet to play it.Here's hoping I get to it before Dragon Age 2 appears.